Stamp Duty is payable on market value or agreement value, whichever is higher. The Stamp Duty for shop/office/Industrial gala/Basement is 5% of the market value or agreement value whichever is higher. 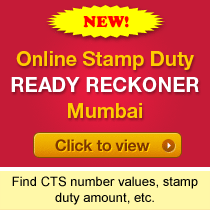 Stamp Duty is charged for every Rs.500 or part thereof of the market value. Registration fee is charged for every Rs.1000 or part thereof of the market value. Stamp Duty must be paid at the time of execution of the agreement. Penalty for late payment of stamp duty is 2% per month on deficit stamp duty amount, subject to maximum 2 times of the deficit stamp duty amount. Stamp Duty on agreement for Sale prior to 10-12-1985 is Rs.5 only. Stamp Duty for Non-Residential Property is straight away 5% of the market value.